Square Footage: 136,000 sq. ft. Contractors and architects across the U.S. are discovering the benefits of Hacker Industries, Inc.'s FIRM-FILL® CMD. 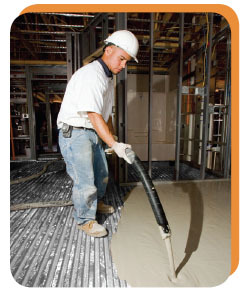 A lightweight, UL-rated, and cost-effective poured gypsum underlayment, FIRM-FILL® CMD is widely used in commercial, multi-family and institutional projects designed with light-gauge steel frame construction and a corrugated steel deck. Fred Hall of Mosley Construction Company, Inc. in North Carolina quickly discovered the many advantages of utilizing FIRM-FILL® CMD on his hotel development, Candlewood Suites of Greenville, NC. 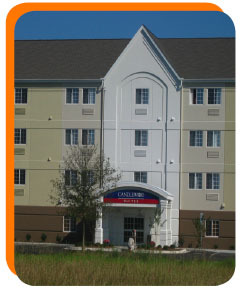 A fourstory, 95-room light-gauge steel frame building with a corrugated steel deck, Candlewood Suites required a practical underlayment system without compromising quality or time. Fred Hall called in KMAC of the Carolinas, a Licensed Applicator of Hacker Industries, Inc. KMAC of the Carolinas offered the solution - FIRM-FILL® CMD, a gypsum concrete-based floor underlayment that utilizes a specialized formula that not only achieves high compressive strengths (minimum 3500 psi), but can also be installed at a much lower thickness than conventional pouredin-place concrete. FIRM-FILL® CMD also dries faster than poured concrete. Like other Hacker Floor Underlayments it sets in 90 minutes, which allows other construction trades to Job of the Month Candlewood Suites of Greenville, NC featuring resume work the following day. To accomplish the job, KMAC's crew cleaned and primed the corrugated steel deck with FIRM-FILL® CMD primer using an airless paint sprayer. They determined that the seams of the steel deck needed to be prepoured to prevent leakage. FIRM-FILL® CMD was then mixed and pumped into the building at 1" above the flutes (1-9/16" total thickness). In one day, KMAC of the Carolinas installed 36,000 square feet. The outcome far exceeded the general contractors expectations. "Using FIRM-FILL® CMD allowed us the ability to save money and valuable construction time," commented Hall. "We saw significant savings due to the lower weight, thinner application and quick installation by KMAC's crew." The end result was an exceptionally smooth, rock-solid floor surface ready for the installation of finished floor coverings. FIRM-FILL® CMD also contributed sound control and fire resistance to the floor system. As a Licensed Applicator of Hacker Floor Underlayments, KMAC of the Carolinas has installed millions of square feet of FIRM-FILL® Gypsum Concretes and GYPSPAN® Radiant in multi-family, custom homes and commercial buildings. For information on KMAC of the Carolinas, call Jerry Krasen at (704) 398-8911.